The electrical and electronic systems in your car or truck are responsible for routing power and information in order to control the behavior of certain systems. The electrical systems are comprised of wiring, fuses, circuit breakers, and relays. Over time, wiring can break or become loose, switches and connectors may brake, leading to intermittent power or complete power loss of your vehicle. If you are experiencing trouble with your electrical and electronic systems, give the ASE certified electrical systems repair specialists at Four County Import Center a call or stop into their Mt. Airy, MD auto repair facility. Our auto electrical system experts are able to diagnose and repair problems during an electrical and electronic systems service. We can locate shorts, grounds, open, and resistance problems in electrical and electronic circuits, and we can perform all necessary repairs. Electrical repairs include turn signals, hazard lights, door locks, and headlight problems such as brightness, dim, intermittent or non-functioning headlights or bulbs. 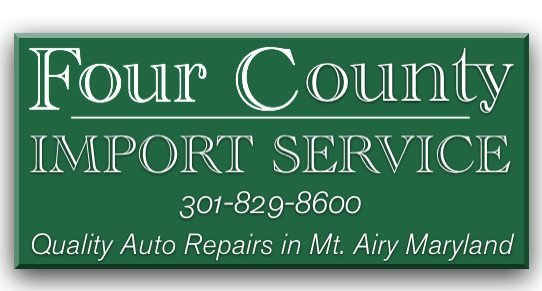 Four County Import proudly serves drivers with quality electrical systems maintenance and repair in Mt. Airy, MD, and surrounding Frederick County, Montgromery County, Carroll County, and Howard County. Give us a call at 301-829-8600 or stop in today!